For being a slow year for trading card lawsuits, 2017 has started picking up in the last two months. First, Topps sued one of its former Garbage Pail Kids’ artists. Then Upper Deck filed an action to collect a debt. Both somewhat low-key (if not boring) lawsuits. BUT, now we have easily the most exciting lawsuit of the year: Upper Deck v. Leaf. Legal aside: Welcome back to the game, fellas! I missed you! On Nov. 21, Upper Deck sued Leaf, targeting Leaf cards which contain memorabilia from exclusive Upper Deck athletes such as Michael Jordan, Bobby Orr, Patrick Roy, and Wayne Gretzky. These cards appeared in Leaf products such as 2017 Leaf In the Game Superlative Hockey, 2017 Pearl and 2017 Leaf Q.
Collector aside: Though crowded, those are some nice-looking cards! Basically, Upper Deck alleges that Leaf’s use of its exclusive athletes hurts Upper Deck’s rights. What’s odd is how Upper Deck pleads its claim. Upper Deck alleges since it has an exclusive license to use these players’ names, likenesses, and other “personality/publicity rights” on trading cards, and Leaf has no such license, that Leaf is trouncing on Upper Deck’s athletes’ rights. Seems a little attenuated, right? I mean, we’ll have to wait and see what contractual rights Upper Deck received from its athletes (legal aside: maybe Upper Deck has the right to sue on behalf of these athletes), but it seems if Leaf is violating athletes’ rights, it would be the athletes that would need to bring suit. Again, Upper Deck focuses on the athletes’ rights, but here it also alleges violations of its “exclusive agreements” with those athletes. This “exclusive agreements” argument is similar to an allegation Panini made against Leaf over Kevin Durant autographs in 2012. There, Leaf obtained stickers of Kevin Durant autographs, applied them to previously released Kevin Durant rookie cards (made by Panini and Topps) and released them in its 2012 Leaf Best of Basketball product. Thinking that Leaf was somehow creating “new” Kevin Durant cards, Panini sued Leaf, alleging that because Panini had an exclusive license with Kevin Durant, that these cards somehow violated Panini’s rights. Although this suit settled confidentially (as 90%+ of all lawsuits do), I predicted multiple times that Leaf was going to win. Legal translation: Basically, Leaf was not a party to the exclusive license between Durant and Panini, and therefore could not breach it. 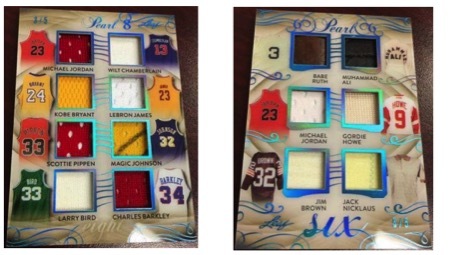 Now, this Upper Deck v. Leaf case is a little different from the Panini/Durant case, because all Leaf did there was place stickers on cards and resell them. Here, Leaf has created new cards, and included the players’ names (along with their memorabilia). Is this enough to cause the likelihood of confusion amongst consumers necessary for Upper Deck to win? I don’t think so. It’s not like Leaf markets these cards saying Upper Deck’s athletes endorse them, or are somehow affiliated with Leaf. Instead, Leaf basically took scissors to these (and others) athletes’ jerseys, put the cut-up patches into cards, and explained on the cards where the jersey patches came from (sometimes, including an image of the jersey). Whether this rises to a level of culpability will be for a jury to decide, but I think Leaf’s use falls more under a “fact” (which is an OK legal use) rather than an “endorsement,” and thus a Leaf victory. That being said, you never really know how a lawsuit will end…especially in areas not tested before. The next step in the action will be Leaf’s response to Upper Deck’s complaint, which will likely happen 30-60 days from now, and then we’ll be off to the races. Which, while ensuring there won’t be much more action in 2017 for Hobby lawsuits, makes very likely that 2018 will be an exciting time. And as a final legal aside, is there anyone in the Hobby that has not had a turn suing Leaf? Topps did…Panini did…so…yes, now that Upper Deck has joined the fray, I guess everyone has. Well done, Leaf. Well done. Funny that those Durant stickers come up again….. Rumor I heard from some pretty credible sources was that some, if not all, of those stickers were signed by someone other than Durant and actually still passed authentication. I was going to buy one until I was told not to and the reason why. Yet another reason why the hobby needs to be cleaned up, I’m afraid. Maybe collectors should band together and sue Topps for not providing equivalent value replacement cards on expired redemptions. If you have not seen it, Leaf came back strong. Leaf sued Upper Deck in Dallas for antitrust violations on November 22.